When Jill was growing up in Rock Island, Illinois, she loved seeing the afghans her mother crocheted before she was born. So from childhood she was aware of the satisfaction of making things for others. Jill began with needlepoint. She also loved smocking dresses for her two daughters when they were small. However, it was not until she and her husband moved to Florence, Kentucky, after their marriage, that she became truly interested in quilting when she visited a remote quilt shop in Dry Ridge. That was the beginning! 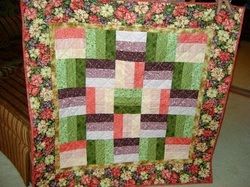 After they moved to Naperville, a good friend recommended that she look for a quilt guild. She visited area guilds and in 2013 selected Riverwalk as a good one to join. She is currently serving with Donna Millican as Hospitality Co-Chair. 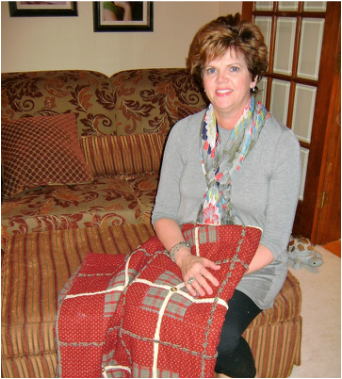 “It makes my heart happy when I see a quilt,” Jill says. She regularly visits all the quilt shops in the area, eagerly looking for patterns to try, fabrics to work with, and other supplies to make the magic happen. The shops are also her go-to places when she needs answers for solving sewing problems. A trip to the AQS show in Paducah, Kentucky surprised her with its bounty of quilting tools a quilter should not live without. She laughed as she told of her resistance in the face of such salesmanship and acknowledged that she probably came home with more than needed. The beauty of her work is clear including the beautiful petite jacket for her first born daughter that she made 28 years ago! 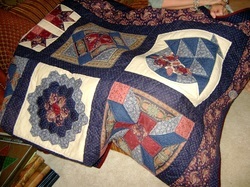 When a family member needs a new quilt, Jill starts planning and piecing, usually in a traditional pattern. Although her sewing time is very limited because of her intensive employment schedule, she is efficient and well-organized. When she’s stuck on a specific technique, she consults YouTube for solutions. She is quick to say she thoroughly enjoys and admires all the talented artists the guild showcases. Her quilting goals just now are few, but somewhat daunting: first, she’s hoping that binding will become easier for her to maneuver as she becomes more experienced. And then if she could only find more time to quilt!